“Perfect for writing a successful thesis! I wish I had come across this book a couple of months ago! I actually recently just completed my Master’s thesis in Communications and this book would have been so helpful to have. The author gives a lot of tips on how you can complete your thesis in time and how it can turn out amazing. I liked how the author mentioned that a lot of people feel as though they don’t have the motivation to complete a Master’s thesis or they feel as though they can’t do it. That’s how I felt when I started my thesis and thought that I would never complete it. This book gives you the motivation and strength to complete the project. The 8 steps were so helpful and if you follow them, you will be able to create a thesis in just enough time. I liked how the author noted the importance of research and the ways to go about your research. I felt as though this tip would have been very helpful for when I was going through my own thesis. I didn’t feel as though I had enough time to research and did not get very detailed research. The book also would help you pick a topic that would be good for you and that would have a lot of content to research about. 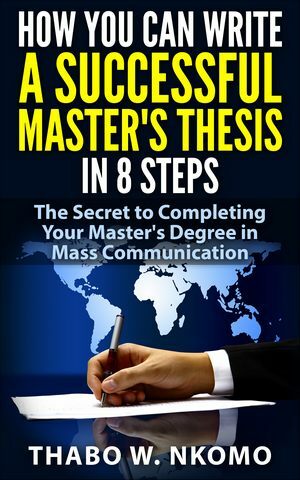 Get Successful Master’s Thesis in 8 steps today!